It is rumoured that this mysterious surf outfit was formed in Mars! Possibly the cover artwork and the song titles led many to such a conclusion! As the back cover reveals, it is about "an official Frantic V conspiracy!" In fact, THE OVERTONES are 3 of the 5 members of the mighty garage group, The Frantic V, in disguise! Besides their devotion to garage beat, they deliver a couple of cool surfin' tunes. Their first long awaited release is a killer 7" single of spine-tingling instrumentals! "Surf Spyder" captures the band in a spy-influenced tremendous high-speed instrumental with full reverb and a hint of mystery! 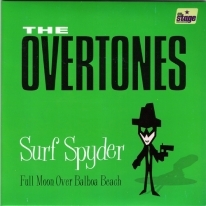 A lot of neo-surf bands in the past got inspired by spy themes and put it into the surf genre (remember The Boardwalkers, Man Or Astroman?, Men From S.P.E.C.T.R.E., The Phantom Surfers and more). Imagine an a-go-go "007" Bond trying to balance on a surf board in the rough sea!!! The flip side "Full Moon Over Balboa Beach" is a charming mid-tempo tune full of romance that recalls stunning 60's compilations of the genre such as "Surfer's Mood". It is the right tune for the sunset where the surfers have put aside their boards after a day of continuous battle with the rough waves! THE OVERTONES debut piece of wax is destined to all those who love the tender side of surf instrumentals. Enjoy!